Walking around the café terrace at night. Can you imagine how wonderful it must feel to know that anyone in the world could stand in the very spot that Vincent Van Gogh was creating this painting? So many enlightening conversations must have taken place in this coffee house. 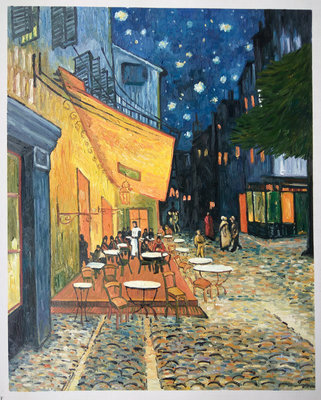 Hand-painted reproduction in oil on canvas of Van Gogh's Cafe Terrace at Night. Painted in 1888, the Café Terrace at Night was one of his first set of creations done in Arles. The café still exists, but under the name Café van Gogh. A wonderful gesture done to help bring an imaginative painting into a reality of everyday life. Vincent’s excited inspiration was in full bloom. The flurry with which Mr. Van Gogh created this composition was in a major contrast with the seemingly nocturnal setting. Van Gogh wrote to his sister: "Here you have a night painting without black, with nothing but beautiful blue and violet and green and in this surrounding the illuminated area colors itself sulfur pale yellow and citron green. It amuses me enormously to paint the night right on the spot." These words seem to pop out like his artwork. Look at the way Mr. Van Gogh emphasized various specific areas. His technique and creative genius makes you focus on the bright lights. A deceptive mechanism to steer us away from focusing on the people outside the cafe. The yellow and orange colors can shine loudly, making you look past one of the reasons why I include this in Van Gogh’s most amazing creations. It is the people that should be focused on here. You definitely see how calmly they walk. Those sitting are in a strong posture. A nice contrast between the two. Preparing for The Starry Night? Look at the wonderful sky. One cannot look at this specific spot and not feel that Mr. Van Gogh was preparing something wonderful in his mind. “When I have a terrible need for religion, I go outside and paint the stars,” wrote Vincent. Having his famous stars shine at night, he elevates this beauty to the heavens.